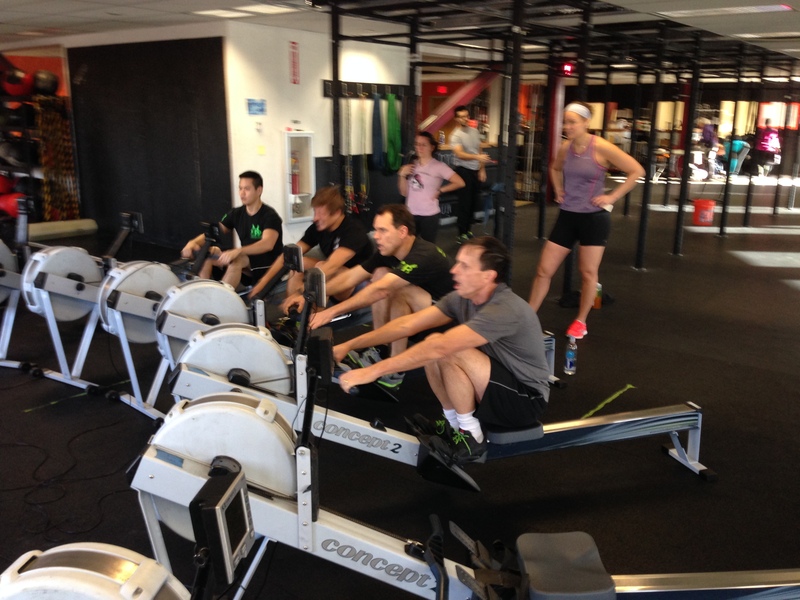 The Men attacking their 2k in Heat 2 of the Renegade Rowing League on Saturday! Last week we focused on suspension. As you warmup today try to feel connected to the footboards and remain weightless on your seat throughout the drive. Be sure to keep the force horizontal and don’t do any more work than you have to. For the first half of today’s Rowing WOD you should really emphasize and feel the connection to the erg through your feet. Feel nice smooth suspension every stroke. In the second half of this workout focus on the release. The goal is to suspend and push through the heel/full foot and then just as you finish the stroke keep the balls of your feet attached to the footboards. We don’t want to rely on the straps to pull us back up. Our finish should be powerful but in control. One cue is to point the toes as you finish the stroke. Also ensure that when you finish the hips aren’t tucking under. Stay on your sit-bones and transfer the weight to the front of your seat as you swing into the recovery. I know this is a lot to think about, so don’t get to caught up in it. Just be smooth and stay connected to the footboards through the bottoms of your feet. Post your average splits from each piece to comments! Checkout the Renegade Rowing League! If you’re interested in competing this year it will be held on December 20th and January 24th. You can register online here! Deadline to register for the next competition is December 18th. The lower stroke ratings with maintaining a fixed split are always harder to target. Solid work Thor! Keep working on those lower stroke ratings and you’ll make the higher stroke ratings more efficient and powerful! 11/24: 3952m, 2:31.8/500m, @ 24 <-This was attempted after Crossfit WOD…oops. 2. Coffee is my mobility. 3. You will get sprayed with Windex if you don't move away from the erg in time. Haha great work this morning Linh! Keep it up! Thanks Ward! Great work and good focus on the last 4. Have an awesome Thanksgiving!